My sister asked me for a chili recipe, make that an easy chili recipe. So here it is: black bean tomatillo chili. What I like about this chili recipe is that it’s totally flexible. Follow the recipe the first time you make it. Then change it and own it. I like to cook my beans. But this is not necessary. If you have a can of black beans add them. The same is true for the tomatillos cook or buy a can and dump into the mixture. The meat component is up to you, add your favorite, or go wild and add lamb, bison whatever, or leave it out entirely. 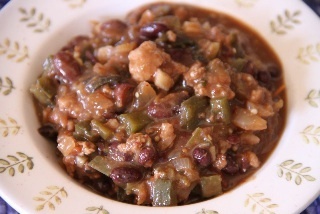 This black bean tomatillo chili recipe is one to claim as your own. 1 pound Ground turkey or ground meat of your choice. Or if you prefer not to have a meat component. Proceed sans meat. Black Bean Option One--Soak dried black beans over night. The next day cook beans with large chopped onion, 8 cloves of garlic, 1 tablespoon of instant coffee, 2 oz mexican chocolate, a stick of cinnamon, with water that is about an inch over the beans cook until done Option Two--buy a 19 oz can of black beans. Add dash of cinnamon, chocolate and extra coffee to chili. Heat a medium stock or soup pot till it's hot. Add the 2 chili arbol pods. Brown on each side. Please wear gloves while handling. Cool pods and grind. Heat the same pot splash some olive oil, add meat of your choice, brown and season with salt and pepper. Add onions and garlic. Cook on medium heat for 2-3 minutes. Add cumin, ground chili arbol. Start with a teaspoon and add more if needed, chopped chipotles (start with two and taste). Stir. Cook for two minutes. Add beer. Bring to boil. Add instant coffee stir until dissolved. Add chopped tomatillos. Bring to boil. Add jalapenos (if using). Start with a few and adjust as you go. Reduce heat to a simmer and cook until tomatillos begin to soften. Taste for heat, balance of peppers, salt and pepper. If using canned beans: rinse and drain black beans. Add to pot. If you chose to cook your own add.. Cook for another 15 minutes. Taste, adjust. Eat. Perfect for the cold and snowy weather I am currently in. Sounds like a wonderful chili, Judy! I love it really spicy. I’ve not made chili in ages, so thanks for putting it in the forefront! I quadrupled the recipe and served up to 25 guests who could not get enough! Half the batch had the arbol and the other half without for milder. No jalapeño for this crowd but it was all so perfectly flavored!